1.Threonine is an important nutritional supplement which could fortify cereals, pastries, dairy products, restore the body as fatigue, and promote growth and development like tryptophan. Due to its structure contained threonine hydroxyl,which could held the water on human skin and combined with the oligosaccharide chains to protect cell membranes. Threonine plays an important role in the body, promoted phospholipid synthesis and fatty acid oxidation in the Medicine field as well. 2.For biochemical research, the pharmaceutical amino acids could be a nutritional medicine to cure anemia primarily. 3.Amino acid as medicines is mainly used in amino acid infusion, comprehensive amino acid preparations and food nutrition fortifier. Such as the lack of threonine can cause loss of appetite, weight loss, fatty liver, testicular atrophy, anterior pituitary cells, dyeing changes and bone development. Adverse reactions Contraindications: When an adult infusion 22.5g, can cause fever, headaches and other adverse reactions. 4.Nutritional supplements. To meet the need of cereal protein, L-lysine is the first, another is L-threonine. 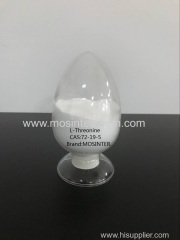 Even though the content of L-threonine is high, the binding between peptide and threonine is difficult to hydrolysis, and not easy to absorb and digest. It is also could be used in preparation of amino acid infusion and comprehensive amino acid preparations. 5.One of the essential amino acids in human body, it can be used to improve nutrition and physical fitness.